I am a firm believer in fate; it is just so much easier to blame it for your own failures. But more than that, I believe in fate because if the choice was left to me to steer my life the way I wished to, I would’ve been in a completely different place, doing a completely different thing and been a completely different person from who I am today. I can almost imagine myself in an alternate universe, nearly fainting at the sight of flowing blood while bravely trying to carry out a surgical operation with toothpicks and shaving blades in a grimy state-run hospital, because obviously I had decided at the tender age of 4 that I wanted to be a doctor when I grow up, accomplishing never-done-before feats and saving the world single-handedly. Safe to say, ever since I found out that dissecting frogs was the first step towards becoming a medical messiah, I pretty much buried any such aspirations. I can recall the time when I was watching the Olympics approximately twenty years ago, I thought to myself that I could very well get Pakistan its first gold medal in gymnastics because gosh could I do those cartwheels! For the longest time I assumed I just had to just that and I would be selected, but of course that was not the case. And while I was still moping over my shattered dreams, I was told by my very proper mother that young ladies should not be trying the contorted positions I was attempting to do with my feminine body. It’s quite another story now that my very proper mother tries to explain the difference between gymnastics and exercise and how I desperately need to start doing the latter so I can stop resembling a sack of potatoes. My dream to become a figure skater was also short-lived because it occurred to me that one needs grace, poise and balance to even go a yard on those skates; I don’t possess any of these qualities. Also, one should have career aspirations suited to the climate one resides in…it is really hard to find an ice skating rink in a city where the coldest of winter nights can be comfortably spent in a hoodie and sweatpants. And where the winter season lasts as long as the new iPhone in stores on its launch. So I sought comfort in socializing with the dead, I mean not exactly socializing, I just spent a lot of time reading about the history of humankind. 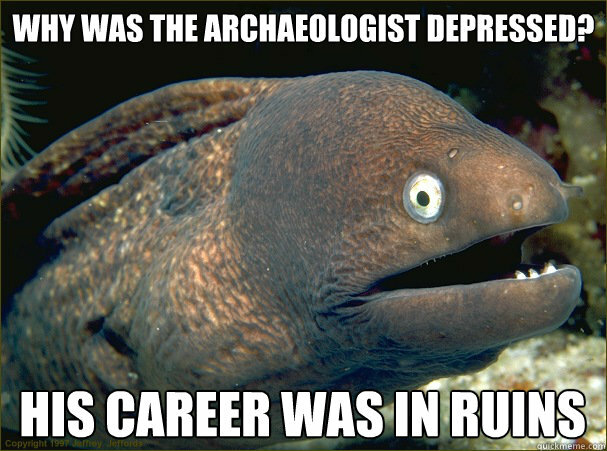 Suddenly I found my calling in the ruins of Rome and the pits of the Pyramids; I was gonna be an archaeologist. It seemed quite a promising choice considering Pakistan was home to one of the oldest civilizations in the world, namely the Indus civilization. But then I noticed nobody was interested in clay figures and crumbling bricks, there was no proper education and there was no career opportunity. Everything uncover-able in Moen-jo-Daro had been uncovered, everything loot-able had also been looted, I was a couple of decades too late in being part of the great discovery. It wasn’t helped by my brothers who ‘encouraged’ me to become an archaeologist by telling me that I would take so much time brushing away the dirt on some stone idol that it would add even more value to the antiquity, because let’s face it, where historical things are concerned, the older the better. So I poured my emotions onto my sketchpad, pleasantly surprised at my own artistic abilities. Gee, I could totally grace the walls of art galleries worldwide with my black and white sketches. So it was decided, I was going to be an artist. The only problem with this lovely picture was that I refused to pursue an education in art. I had seen people hating their talent when forced to sit and draw still-life when they were itching to paint the world in abstracts. To me at that age, the idea of being taught by another in something that I was gifted by God was just too stupid to comprehend. If I draw an obese Cinderella well, why should someone force me to draw the Misty Mountains? Who are you to tell me that hair cannot look like the wayward rays of the sun? This argument was of course somehow translated into me being too stubborn for my own good and to this day I think it better to pick up a pencil and sketchpad when I feel the need to draw, instead of splashing paint onto canvas because my livelihood depends on it. And so I found solace in the written word, consuming books and novels by the dozen, stealing the abridged works of Shakespeare from my brother’s desk (he never noticed of course) and reading and then re-reading the plays by the age of ten. I was a Reader and I would happily indulge in my love for reading at the cost of my eyesight, which is now so poor that my own arm ends in a beige blur when I can’t find my glasses. Near-sighted people would understand the paradox of needing glasses to find glasses whenever we lose them. It is also the reason I cannot enjoy the measly splashes we call rainfall in Karachi. Btw, being a Reader doesn’t pay well I learnt. Actually it doesn’t pay at all. In fact, you PAY to read, so basically let’s just strike that off our list of career choices. And yes I have considered being an editor, even served as one in college, but that’s just too much responsibility, and to be honest, I am overcome by hysteria when confronted by spelling and grammar errors, so yeah, I’m quite happy reading nicely edited books at my leisure which do not put my sanity at risk. Left to ponder the greater mysteries of life which involved my future, I suddenly found myself drawn towards the stars, not in a romantic way mind, but more in the Stephen-Hawking-and-Black-Holes kind of way. I was convinced I was going to be an astrophysicist because it was just so cool. Over time I realized astrophysics is not limited to NASA only and that a citizen of a third-world country spends more time on the lower levels of the Maslow hierarchy than to ever bothering to climb up and into a space shuttle and shoot off into self-actualization. So when that ship failed to sail I looked deeper within and wondered about atoms and electrons. Nuclear physics seemed pretty fascinating, why not think about pursuing that eh? It just so happened that I failed chemistry and at the same time come to know about the destructive powers of this field of physics. Nope, I was not going to venture into mushroom clouds, I am quite content with the Cirrus, Comulus, Stratus et al, thank you very much. But I was still the only geek in high school who aced the physics test out of sixty students and seemed to be like a bunny on Red Bull when left in the physics lab. With my final exams under way, I needed to pick a career and choose a university for my undergrad, so I decided to put my artistic skills and love for physics together in the quest to become an architect. The entrance test for the art school was going to be in December, I still had half a year to waste. On a sleepy Sunday in the summer of 2006, I was forcefully sent to sit for an entrance test of one of the top business schools in Pakistan. I was half-asleep, still in my pjs when I sat for that test. Convinced it was a fluke that I was part of the lucky 5% who got in out of 3000 hopefuls, I spent the first semester in IBA always ready to go home when the REAL slim shady turned up to claim his enrolment that I had stolen. Finally accepting that I was the real slim shady, I was now a finance graduate, hoping to become an investment banker. Finance just made sense, marketing to me was more intuitive, and I was bad with emotions anyway. Lo and Behold! I got hired as a graduate recruit in the top global technology giant as a consultant for banks. A business graduate in IT. Rumor has it that I did it for the lulz. Fellow male recruits speculated that I was ‘Equal Opportunity Employment’ in action. A year and a half later I was a pro in my field, sort of, but I was still only just an undergrad. But would they make me a senior consultant without a Masters degree? HAHAHANO . So the decision was made, I was going back to school for my MBA. Having spent so long away from finance I couldn’t reconnect, and my marketing graduate friends seemed to have much more glamorous careers so I decided to take the plunge. I was going to become a marketer. I swore never to go back into the banking sector, and slowly let go of my love for finance like a gold-digger who gets no inheritance. Spurred on by friends I was sure that I would acquire the coveted title of Brand Manager at one of the top MNCs in Pakistan. I dove right into the Philip Kotler collection. I was now an MBA, with a major in Marketing, an above average student who cleared all aptitude tests thrown my way. I was interviewed at all top companies. I was on a roll. Everyone was sure I would be one of the first to get a job, one of the few to get into an MNC, one of the few with an enviable salary package. You remember what I said about fate running our lives? That’s exactly what I told myself whenever I found out I didn’t make the final cut for one or the other reason. In fact I wrote about my job-search experience in this post a while back. I decided to put it all on fate; if I didn’t get a particular position at some company, it wasn’t meant for me. In the end I found myself in a completely different place from where I had first imagined myself to be. All for the best I hope. For sure being a marketing manager is on the opposite end of the spectrum from where a doctor would have been, if I had been left to my own devices. Who knows, ten years later I might actually become an anthropologist, studying indigenous tribes in the Amazon. Who knows? For now I shall perform a surgical operation on this marketing plan on my desk and hope it doesn’t bleed the company to death.